The Cambridge B2 First (FCE) for Schools is a challenging exam, and the Use of English section is the most difficult part. Students often tell us they feel unprepared for it. That's why we have worked with a top FCE teacher to create FCE Academy for schools, which has more test practice questions than any other app, website or textbook. Click on the images to take a closer look. FCE Academy for schools is for students preparing for the Use of English section of the Cambridge B2 First (FCE) for Schools examination. It contains 36 exam-style texts with over 1,000 individual assessments and closely replicates the Cambridge B2 First (FCE) for Schools exam experience. Our mission is to help you pass this important exam with the highest possible marks and we believe FCE Academy for schools achieves this goal. But don't just take our word for it: read some of our user reviews to see what the students and teachers think. 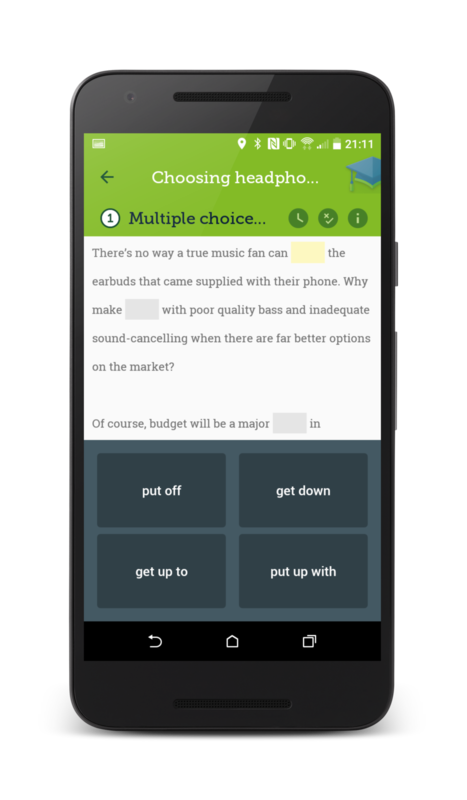 You can also try the free Lite version of the app, which contains a decent selection of Use of English tests, and make your own assessment. The FCE Academy for schools content has been written by Michael Macdonald, a teacher of Cambridge exam candidates, and reviewed independently by a Cambridge ESOL examiner. We worked with many FCE teachers during development. Parts 1–3 each contain 36 texts of approximately 160 words; each text contains 8 assessments; and each assessment carries 1 mark. Part 4 comprises 72 short texts or single sentence assessments; each assessment carries 2 marks. Test menu: By selecting an exam part from the home screen, users are given a choice of 36 texts to work with and information relating to their progress to date. Exam and practice modes: By selecting the marks icon when taking a test, right and wrong answers are identified in real time. Alternatively, select this feature to reveal overall accuracy upon completion of a test. Timed tests: By selecting the timer icon when in a test, the time taken to complete the test is displayed. Instructions: The ‘information’ button at the top of each screen contains instructions relating to each particular test. Transcripts: Records of completed texts and details of scores and time are available at the end of each test, with stats appearing in each test menu. Social media sharing: Share your progress with friends and colleagues on Facebook and Twitter! Part 1. Multiple choice cloze: This question type comprises a text with eight blanks, each blank prompting multiple-choice questions. Each question has four possible answers, only one of which is correct. Part 2. Open cloze: This question type again comprises a text with eight gaps, each gap representing a missing word. No hints are given this time: you must think of the correct word for each gap and type it in. Part 3. Word formation: This question type is another containing a text with eight gaps, each gap representing a missing word. Beside each gap this time is a ‘prompt’ word that must be altered in some way to complete the sentence correctly. Part 4. 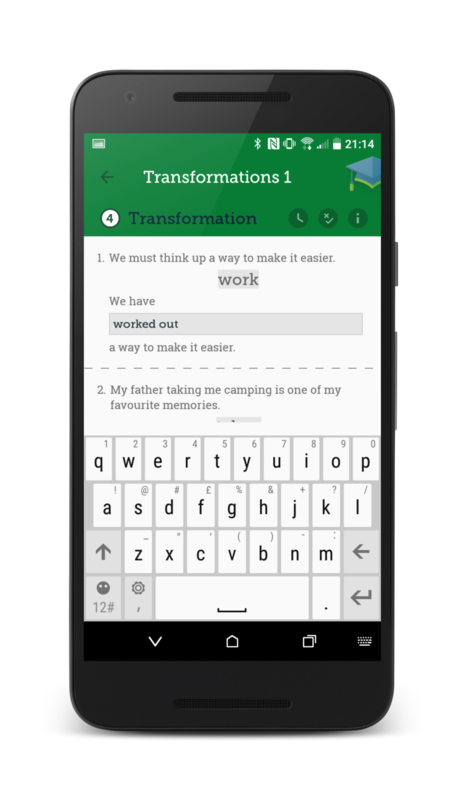 Key word transformations: This question type contains six sentences, each followed by a ‘key’ word and an alternative sentence conveying the same meaning as the first but with a gap in the middle. In no more than five words, use the key word provided to complete the second sentence so that it has a similar meaning to the first sentence. Decide for yourself whether you'd like to invest in this celebrated exam resource and unlock the full content. Or get a 10% discount by downloading directly from this website (Android only).